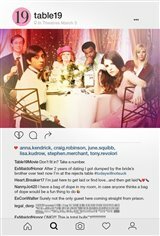 Ex-maid of honor Eloise (Anna Kendrick) — having been relieved of her duties after being unceremoniously dumped by the best man via text — decides to hold her head up high and attend her oldest friend's wedding anyway. She finds herself seated at the "random" table in the back of the ballroom with a disparate group of strangers, most of whom should have known to just send regrets (but not before sending something nice off the registry). As everyone's secrets are revealed, Eloise learns a thing or two from the denizens of Table 19. Friendships — and even a little romance — can happen under the most unlikely circumstances. Table 19 Exclusive Deleted Scene - "Cousin Donny Toasts It"